But Benelli? Benelli who? Don’t they make shotguns? 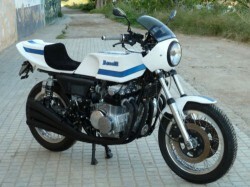 The Benelli Sei [“Six”] went into production in 1972 and was superseded by the 900cc version in 1978. It was envisioned by famous Argentinean Alejandro De Tomaso, who purchased the company in 1971, as a shot across the bow of the Japanese giants, a statement of intent that the Europeans could compete in terms of technological prowess. Ultimately, it was produced in numbers too small to really make a dent in the competition. 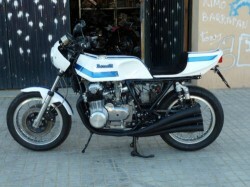 The motor was reportedly based on the Honda CB550 four, with two extra cylinders grafted on. Styling by Ghia seems relatively conventional now, but was considered very striking at the time. The 750cc version put 71hp through a 5 speed transmission. With a dry weight of 485 lbs, the bike was capable of 126mph. Testers at the time praised the smooth motor and the Ferrarri-like exhaust note, but were critical of the limited ground clearance, limited fuel capacity, and price. 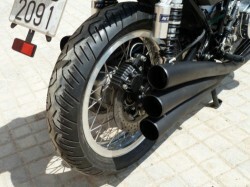 The Sei shown here for sale ups the ante with a custom fiberglass duck-tail, a custom fairing and dash combination, and a swoopy, blacked-out six-into-six exhaust that apes the styling of the extremely desirable 750 four cylinder bikes assembled by Magni. I bet it sounds wonderful. 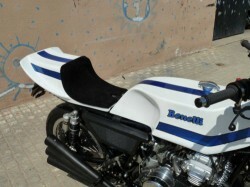 Benelli -Bimota 750sei fully restored for sale. This is a replica of the original model ordered by the spanish importer on the 70 . 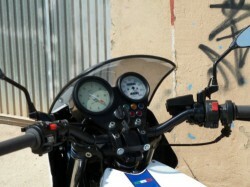 The engine has been improved with new electronic ignition, new electronic charging system and a set of 1000cc forged pistons.The head has been tunned with bigger valves, hot cam, bigger carbs, including a ramp of six carbs under order, reinforced dry clutch, oil cooler and a set of curved megaphones, MV Agusta Magni style. The bike as never been rided after restoration. If you´re looking for some rare and exotic, that could be your bike. 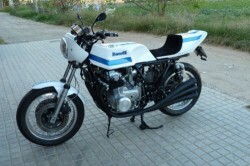 I can sell all the spare parts manufactured and fitted in this bike to build a similar cafe-racer yourself. The price for the bike is 12.000 dollars. World wide delivery. The final cost to USA including transport, import taxes, insurance and new local plates is 2.000 dollars. If you doens´t like the original color (white and blue) I´ll repaint it as your preference. These don’t come up for sale often, so it’s hard to know what this bike is really worth, but $12,000 is very steep for a Benelli Sei… Although the engine work and cosmetic upgrades do make it one-of-a-kind.